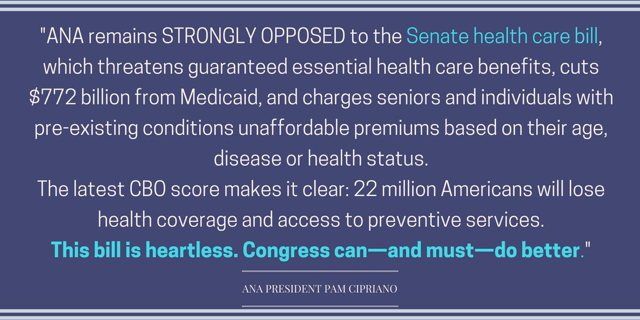 Today, The Congressional Budget Office(CBO) released a report on the financial implications of the Senate Republican health-care bill. According to the CBO the Better Care Reconciliation Act would increase the number of people who are uninsured by 22 million in 2026, with 15 million uninsured by 2018. The CBO reports also suggests the effects of the Senate bill would be particularly hard on millions of low- and middle-income Americans, as well as older Americans ages 55-64. It forces states to scale back their safety nets and prompts insurers to pare down benefits and raise deductibles in response to weakened regulations. The legislation would decrease federal deficits by a total of $321 billion over a decade. However, this could be largely due to the proposed $772-billion cuts in Medicaid spending over the next decade. 1. Amends provisions of the stability and innovation funds section to allow both short and long-term funds to be used to purchase health insurance benefits. 2. Would allow an insurer in the individual market to impose a waiting period of six months on an enrollee who had had a gap in coverage of 63 days or more during the preceding 12 months. This is a significant change with respect to individual market requirements. The original Senate bill repealed the individual mandate but left nothing in its place to encourage healthy people to enroll in the individual market. 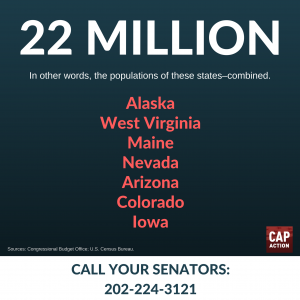 Again, we continue to ask and remind you to call your Senators and tell them to #ProtectOurCare and #ProtectOurPatients! Next Next post: And Here’s What You Missed On Healthcare!